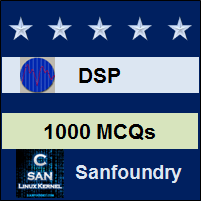 This set of Digital Signal Processing Question Bank focuses on “Comparision of Design Methods for Linear Phase FIR Filters”. 1. Which of the following is the first method proposed for design of FIR filters? Explanation: The design method based on the use of windows to truncate the impulse response h(n) and obtaining the desired spectral shaping, was the first method proposed for designing linear phase FIR filters. 2. The lack of precise control of cutoff frequencies is a disadvantage of which of the following designs? Explanation: The major disadvantage of the window design method is the lack of precise control of the critical frequencies. 3. The values of cutoff frequencies in general depend on which of the following? Explanation: The values of the cutoff frequencies of a filter in general by windowing technique depend on the type of the filter and the length of the filter. 4. In frequency sampling method, transition band is a multiple of which of the following? Explanation: In the frequency sampling technique, the transition band is a multiple of 2π/M. 5. The frequency sampling design method is attractive when the FIR filter is realized in the frequency domain by means of the DFT. Explanation: Frequency sampling design method is particularly attractive when the FIR is realized either in the frequency domain by means of the DFT or in any of the frequency sampling realizations. 6. Which of the following values can a frequency response take in frequency sampling technique? Explanation: The attractive feature of the frequency sampling design is that the frequency response can take either zero or one at all frequencies, except in the transition band. 7. Which of the following technique is more preferable for design of linear phase FIR filter? Explanation: The chebyshev approximation method provides total control of the filter specifications, and as a consequence, it is usually preferable over the other two methods. 8. By optimal filter design, the maximum side lobe level is minimized. Explanation: By spreading the approximation error over the pass band and stop band of the filter, this method results in an optimal filter design and using this the maximum side lobe level is minimized. 9. Which of the following is the correct expression for transition band Δf? 10. If the resulting δ exceeds the specified δ2, then the length can be increased until we obtain a side lobe level that meets the specification. Explanation: The estimate is used to carry out the design and if the resulting δ exceeds the specified δ2, then the length can be increased until we obtain a side lobe level that meets the specification.